Fancy A New Hobby in 2012? This is the time of year when many of us resolve to “change our lives”. It may be that we resolve to make a lifestyle change – lose weight, get fit or stop smoking or it may be to learn something new. Whilst a visit to us in Snowdonia can be part of your lose weight, get fit and stop smoking resolutions we also have lots to offer in the learning a new skill side too. 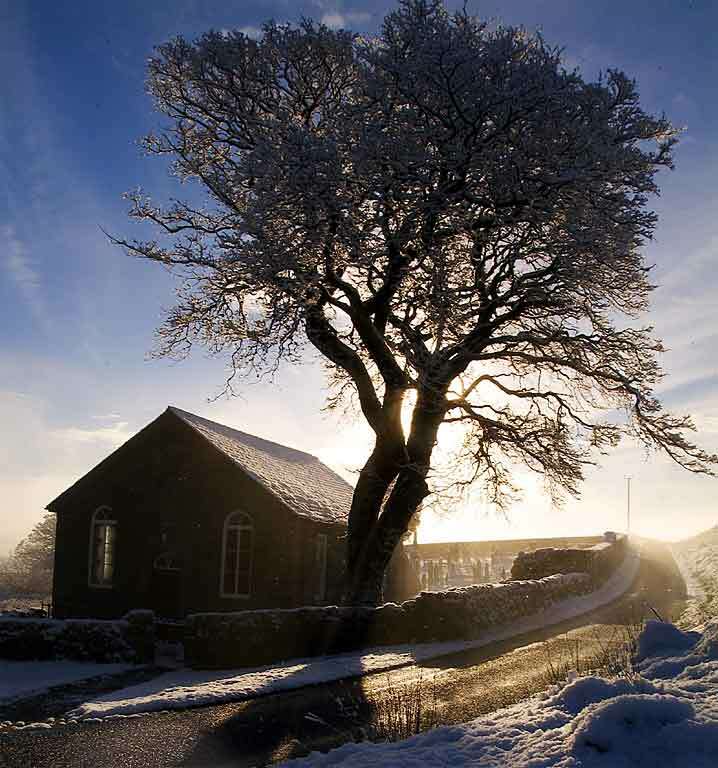 We’ve put together a list of suggestions for courses local (within 30 minutes drive) to Cadair View Lodge accommodation. Remember that our log cabin accommodation prices are per property and not per person. So you could bring your family to enjoy a break in Snowdonia whilst you attend your course and the accommodation would cost the same. Learn Photography – This is our sister company. Based at Bronaber, Learn Photography.co.uk offer 1-2-1 or 1-2-2 hands-on, customisable digital photography tuition. No previous knowledge is expected or required and attendees don’t even need their own camera – one can be provided. Course content it flexible to suit each attendees requirements. The group size is only one or two people (e.g. for a couple) so attendees get the full attention of the tutor and can ask as many “silly” questions as they want without embarrassment. This also means that elements can be gone over and over until attendees “get the idea”. Courses are usually run over 2 days and the price include accommodation in a 2 bed roomed, self catering log cabin for 2 nights. Attendees are welcome to bring other members of their family to use the accommodation during the course. from reclaimed materials. Their one day course would see attendees learning the skills and completing a rustic chair or stool. Longer courses to make more detailed pieces of furniture can be arranged. Guests staying with Cadair View Lodge and taking a Wild Welsh Wood one day course between January and end of March 2012 will receive 10% discount on their course. 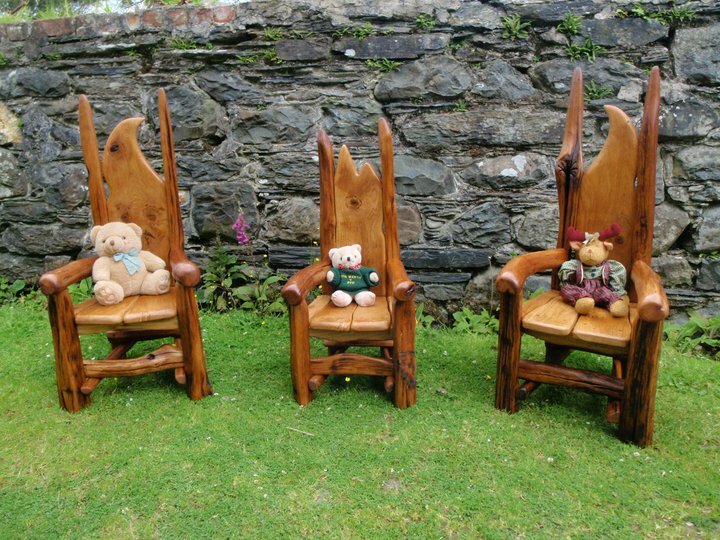 We love Wild Welsh Wood’s story telling chairs. These are the child sized versions of the originals. The Company are based at Dolgoch Falls, about 40 minutes drive from Cadair View Lodge. Sylvanflair, at Corris Craft Centre, also offer wood furniture making courses. Mountain Bike Skills Course – Steve, from Wheelism provides a wide range of mountain bike skills courses at Coed y Brenin trail centre which is 2 miles from Cadair View Lodge. He also runs bike maintenance courses. Campbell Coaching also provide courses in the area. Snowdonia Safaris – If you’re thinking big game hunting across the hills you’d be wrong. A Snowdonia Safari will help you to learn more about and to experience the food (and drink) that is produced in our area. The selection of safaris is steadily growing and I believe that there will soon be an opportunity to attend a workshop with an artisan baker as part of a safari. Guests staying with Cadair View Lodge will receive a discount on their safari. Nature and the Environment – Teaching children through being outdoors is becoming ever more popular with Forest and Beach schools being talked about regularly. When you come to Snowdonia check out what Ranger activities are being held at Coed y Brenin Visitor Centre just down the road from us. For those who are a little older the Centre for Alternative Technology hold a wide range of day and multi-day courses about 40 minutes away from us. Mountain Skills – Many people come to Snowdonia for the Great Outdoors. Some time spent learning the basics from an experienced instructor can help you to start enjoying your chosen discipline far quicker and also help to keep you safer. Our friends at Seren Ventures (based in Betws y Coed but operating across the National Park) offer a wide range of courses and guiding. If they can’t help you they will be glad to give you the details of somebody who can. Kayaking – The Tryweryn and Mawddach are just two of the local rivers that prove very popular with kayakers To be safe and to enjoy the sport take a course with an experienced local coach. The team at Canolfan Tryweryn can provide a full range of coaching at the National White Water Centre at Frongoch, about 15 minutes drive from Cadair View Lodge. Also check out FlowFree Coaching who can provide coaching at all levels. Drive A Steam Train – Snowdonia is well-known for its steam railways. Come to stay and have a go at driving a train yourself. The Fairbourne Railway offers “exclusive use” of their railway on non-passenger days. The Talyllyn Railway offer a “full day” driving experience. Quilting + Patchworking – Bumble Bee Quilting in Corris run workshops, courses and demonstrations for all skill levels of quilters and patchworkers. They also have a well stocked shop (and an online shop) to provide all of your quilting, patchworking and other crafting needs. Fishing Courses – With access to rivers, lakes, estuaries and the sea, Snowdonia is an ideal location for those who love to fish. The North Wales Fly Fishing School based near to Bala offers courses in all aspects of fresh water and sea fishing. See their website for full details of their courses. 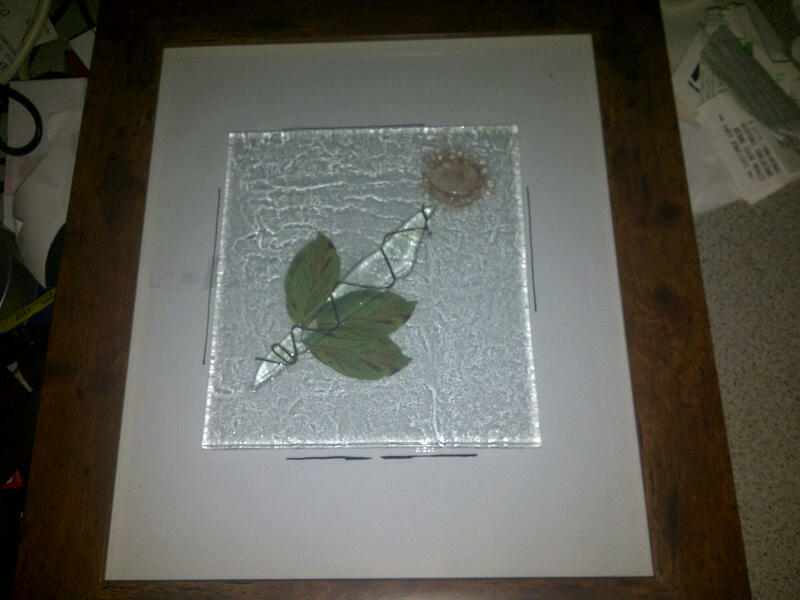 Bill Swann Glass Courses – Bill’s courses run at his extensively equipped workshops in Porthmadog (about 20 minutes drive from Cadair View Lodge). The courses are mixed ability which gives beginners a chance to see what can be achieved by more experienced students. The courses run over 3 days to allow for the preparation of materials and the overnight firing of pieces. I attended one of Bill’s courses last February and came away with some small pieces to use in jewelry, a couple of slump glass pieces that have been transformed for use with candles and a couple of fused pieces that stand on a window ledge. Bushcraft Skills – Are you a budding Ray Mears? You can really experience the wild and decide whether or not foraging and building your own shelters and fires is for you under the supervision of Firefox Bushcraft who run a variety of courses close to us in Snowdonia. 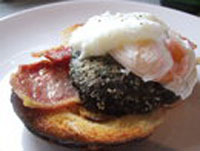 Cookery Coaching – Wild in the Pantry offer occasional cookery coaching sessions. There are usually a number of different topics to choose from each lasting for half a day. Groups are kept small – usually no more than 4 people, and are as “hands on” as is practical given the space. If you would like to run a course, training session or team building event in Snowdonia then contact us to discuss your requirements. Our guests have access to a free training room locally. This room can be fully catered. It will seat up to 40 people “restaurant style” (i.e. in tables of 4) but can configured to meet individual requirements. It can also be blacked out for slide shows. There is so much happening within the Cadair View Lodge 30 Minute Ring that I am bound to have missed something out. If you run a course or training that would be of interest to visitors to southern Snowdonia then please contact us and I’ll add you in an update. If you’d like to work with Cadair View Lodge in 2012 then let me know too. Categories: Family Break, Log Cabin Accommodation, Mountain Biking, Short Break, Snowdonia, Walking | Tags: bush craft, canoeing, class, coed y brenin, cookery course, course, environment, hobby, kayaking, local produce, mountain biking, mtb, patchworking, photo, photography, quilting, Ray Mears, skills, Snowdonia, white water, wood craft | Permalink. It can be tough to write about this topic. I think you did an superb job though! Thanks for this!